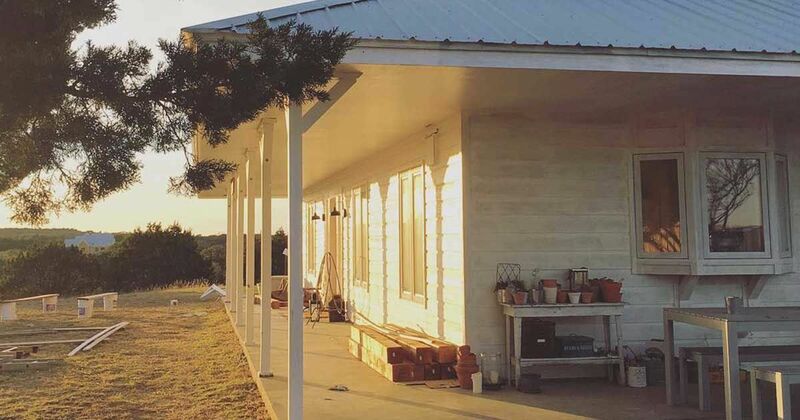 This Texas farmhouse is a work in progress. Set in the wide open prairie outside Dallas, the crisp white siding and light gray metal roof create a classic country facade. A spacious wrap-around porch provides the ideal place to seek refuge from the hot afternoon sun or take in a colorful evening sky. For Allison, a small business owner of a home decor store entitled 'The Festive Farmhouse,' her home is also a type of canvas where she can exact her design dreams. The interior of the home is awash in a sea of pale grays and soft whites. This color palette creates a perfect backdrop for antique finds, rustic woods, and textural linens. The living room ceiling features rows of freshly painted wood beams intermixed with beadboard paneling. The corner fireplace with its thick mantel and trim creates a cozy focal point. Unadorned windows allow sunlight to fill every room of the home with unfiltered light. Strong architectural details and a subdued color palette are what ensure that whatever the season or holiday, festive decor and design will always find a place in this farmhouse. The setting sun illuminates the capacious stretch of covered porch at the front of the farmhouse. A rustic display of antiques, glassware, and greenery creates an inviting vignette just inside the front door. The light and bright living room is incredibly welcoming with its upholstered furniture and tufted ottoman. Due to the placement of the fireplace, the furniture has been laid out at an angle with its focus on the central fireplace. A tasteful collection of ephemera, books, and family photos adorn a wall of built-in bookshelves. A spare section of wall acts as an impromptu office space outfitted with an antique desk and wood chair. Did you enjoy the simplicity of this Festive Farmhouse? Then share this article with your friends on Facebook. Each room in the farmhouse has its own character, while the exterior of the property is highlighted by a massive restored barn that is ready to host any formal or casual gathering.